Not to be confused with Jon Volpe. John Anthony Volpe (/ˈvoʊlpi/; December 8, 1908 – November 11, 1994) was an American diplomat, politician and member of the Republican Party who served as the 61st and 63rd Governor of Massachusetts from 1961 to 1963 and 1965 to 1969, as the United States Secretary of Transportation from 1969 to 1973 and as the United States Ambassador to Italy from 1973 to 1977. Volpe was born on December 8, 1908 in Wakefield, Massachusetts. He was the son of Italian immigrants Vito and Filomena (née Benedetto) Volpe, who had come from Abruzzo to Boston's North End on the SS Canopic in 1905; his father was in the construction business. Volpe attended the Wentworth Institute (later known as the Wentworth Institute of Technology) in Boston where he majored in architectural construction and entered the construction business, building his own firm in 1930. On June 18, 1934, Volpe married Giovannina Benedetto, with whom he had two children, John Anthony, Jr. and Loretta Jean Volpe Rotondi. During World War II, he volunteered to serve stateside as a United States Navy Seabees training officer. In 1953, he was appointed as the Massachusetts Commissioner of Public Works, and in 1956 he was appointed by President Dwight D. Eisenhower as the first administrator of the Federal Highway Administration. In 1960, Volpe was elected Governor of Massachusetts, defeating Massachusetts Secretary of the Commonwealth Joseph D. Ward. He served as governor from 1961 to 1963. In 1962, Volpe was narrowly defeated for reelection, losing to former Governor's Councillor Endicott Peabody. Peabody had been a close friend of then President John F. Kennedy. 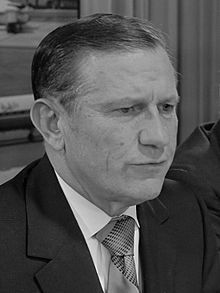 In 1964, Volpe ran again for governor and was able to capitalize on fratricide within the Massachusetts Democratic Party when then Lieutenant Governor Francis X. Bellotti defeated Peabody for the Democratic nomination for governor. Despite the Democratic landslide nationwide that year, Volpe defeated Bellotti in a close race. In 1966, Volpe was elected to the first four-year term in Massachusetts history, defeating former Massachusetts Attorney General Edward J. McCormack, Jr.
During his administration, Governor Volpe signed legislation to ban racial imbalances in education, reorganize the state's Board of Education, liberalize birth control laws, and increase public housing for low-income families. Governor Volpe also raised revenues by his long, and ultimately successful, fight to institute a three percent state sales tax. He served as president of the National Governors Association from 1967 to 1968. In 1968, Governor Volpe ran unsuccessfully as a "Favorite son" candidate for the Republican presidential nomination. He was defeated in the state presidential primary by a spontaneous write-in campaign for New York Governor Nelson A. Rockefeller. It was widely believed that he was hoping to be chosen as his party's candidate for Vice President. Following the election of President Richard M. Nixon, Volpe was named Secretary of Transportation. He resigned as governor to assume the cabinet post, and served in that position from 1969 to 1973. During his tenure as Secretary of Transportation, Amtrak was created. Volpe was the second to serve in this role following the position becoming a Cabinet-level appointment. He received the Award of Excellence in 1970 from Engineering News-Record for his service as Secretary of Transportation. In 1973, Volpe was nominated by President Nixon and confirmed by the United States Senate as United States Ambassador to Italy, a position he held until 1977. Volpe died in Nahant, Massachusetts on November 11, 1994, at the age of 85. He was buried at Forest Glade Cemetery in Wakefield, Massachusetts. The John A. Volpe National Transportation Systems Center in Cambridge was named in his memory, as well as the Governor John A. Volpe Library at Wakefield High School in Wakefield. The papers of John A. Volpe are in the Archives and Special Collections of the Northeastern University Libraries, in Boston. Terminal E at Logan International Airport is also dedicated in his honor. This page was last edited on 26 February 2019, at 08:05 (UTC).